Spending time with God each day is important for continual Christian maturity. When you can have a special place dedicated to your quiet time, it makes it much easier to get into the habit of daily devotions. Not everyone can have a place in their house that they use exclusively for Bible reading and prayer, but with some creativity you can make a shared space work well for you. 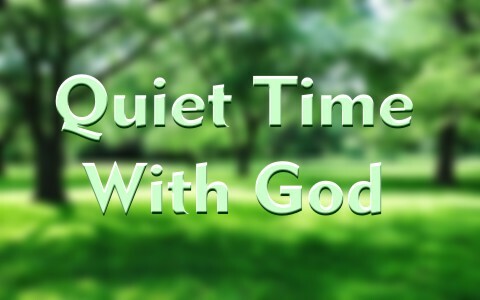 In this article I focus on places for regular quiet time with God. There are times when you can get away for special retreats and spend time with God in a location that may not be convenient for everyday use. But, for the most part, these suggestions are for your daily devotional times. Personally I spend time in daily Bible reading and study right in my living room in my big plush recliner. I want to set a good example for my family and this is currently the best way to do this. I am easily distracted when reading, but have found that I can read my Bible in the living room each morning. I have asked the family to respect the morning time before breakfast so that I can read and study. The downside of this is that I don’t really spend any time in prayer during my living room devotions. My prayer time is when I am in my office at work and can have a little more uninterrupted time. I don’t think this is ideal, but it is what works for me at this stage in my life. Right next to my office is a church that has an outdoor pavilion where I could go and read my Bible. It is open to the public and I have enjoyed spending time there on nice spring days. You may be able to find a park or other public location where you can take your Bible on your lunch break to spend time with the Lord. While this may be nice on days with beautiful weather, you need to also have a fall-back location that you can use when the weather is not so nice. Don’t allow the weather to keep you from working on your daily Christian maturity. The park is lovely but don’t allow the weather to keep you from working on your daily Christian maturity … have a fall-back location. Some of you have a nice big walk-in closet where you can easily set up a folding chair and have your devotions in private. This can be an ideal place to get alone with God. Even if you don’t have a large closet you may still want to try and see if it offers you the seclusion and focus you need for your time with God. Interestingly we often call private prayer “closet prayer” because of Christ’s comments in Matthew 6:6 when He said, “But thou, when thou prayest, enter into thy closet, and when thou hast shut thy door, pray to thy Father which is in secret; and thy Father which seeth in secret shall reward thee openly.” This was in contrast to the very public prayers of the hypocrites. The first time I heard about using a bathroom as a place for quiet time was when my family was in Columbus, GA staying with an elderly saint in the church we were working in for 2 weeks. She was a widow lady and all her kids were grown. She could have had her Bible-reading and prayer time anywhere in the house she wanted. But, when she was younger and had a house full of kids she learned that she could retreat to the bathroom and have her devotions undisturbed. Even though her house has been empty for years she still enjoyed her private time with God in the bathroom. You may have an office at your house where you can retreat to for some personal time with the Lord. I tried this at my house and found it did not work well for me. My office is an unfinished corner of my basement with broken electronics and half-completed projects perpetually littering my desk. The thought of going down into the unheated dungeon causes me to put off my devotions until “later today when it warms up.” Which, of course, never happens. However, your home office may be a welcome fortress of solitude. In that case, enjoy your precious quiet time there. You may even be afforded the opportunity to read your Bible and pray at your regular office like I can. Take advantage of that if it is the best place for you. But, I will also caution you that it is very easy to get pulled into some little task that you want to finish before getting into your personal time. Many times that means that you don’t get around to your Bible reading for the day. Your vehicle may be an ideal place for you to spend time alone with God. It has everything you need: quiet, seclusion, and a place to put your cup of coffee. The only challenge may be sneaking out while no one is looking. I do want to include one place away from your normal routine. This one I will just call a special retreat. A time away from the normal cares of your daily life where you can go and be alone with God for an extended period. That may mean a weekend trip or just a couple of hours one afternoon at a local state park. These longer times of prayer and Bible reading can be rejuvenating and refreshing. This is especially true if you begin to feel like your regular devotion time is being done more out of habit than it is out of desire to spend time with God. Where do you spend your quiet time with God? Please leave a comment below with where you enjoy spending time alone with God. My suggestions may not work for you at all, but our fellow readers may have a great suggestion that you can implement for your personal time with the Lord. Also, in your comments, let us know why this location works well for you. Even if a specific location does not work for me, your reason might help me find other places that are comparable in nature. Hi, David. I loved this article. I do not want to come across as legalistic or religious, but today I didn’t have time with God in prayer and I have been miserable since. Your article was an eye eye-opener! You spoke my mind.You know,after 36 years of married life, since past 6 years I am having my alone time with God! in one of my 3 bedroom house. Believe me! after years and years of praying,fasting ,crying out to God,Almighty God has delivered me! My husband,my son and his wife,and myself live in our home. Jesus proves His love for me every single day! My day starts between 4 and 4.30am (indian time), almost everyday,till about 6.30 – 7am, I spend my time reading,writing the Scriptures,studying all the given references,praying for family and interceding for many lost souls,etc..etc.. I don’t enjoy anything in this world, except spending my time with my Lord! Bro David, please do write to me, if you don’t mind. Hi, David ~ Your article has some great suggestions! I have 10 year old twins and, like Minnie, I spend time with the Lord in the [early] morning, when all is quiet…I also find my car is a great place for worship….and my office rounds out my top three prayer spots. All I want to do is be with the Lord. To shut myself up with Him for hours. I am now allowing myself to be vulnerable before Him. I tell Him everything, and share my heart with Jesus and ask Him to share His with me. I am wanting to devour His Word. I have the mindset of just let me have You even if You never bless me again. I couldn’t pull myself off my knees the other day. I just wanted to be with God. It hasn’t always been like this. Before I was truly saved you couldn’t get me to pray. All I want to do is be with the Lord in relationship. I have a growing love for His Word. I talk to Him about everything. Am I getting on the right track? What a beautiful comment! You are more than on the right track. You are right where God wants you to be!! And more than that, your comment lit a fire in me and a desire to have that intimacy with Jesus again!! Thank you so much!! Thanks for that wonderful piece. I am blessed and what I make of the article is that there shouldn’t be any reason for not having quiet time with God. I think I need to do more, especially learning that a sister among those who have commented, uses her bathroom for her quiet place. God bless you. I have a young son and I am also going to nursing school full-time. Often I find it hard to balance school life, family, and my relationship with God. I’ve had to get creative and consistent with my alone time with Him, by using my free time the best I can. I leave my Bible on my bed so each morning I read scripture, or pray. I bring my Bible to school with me and read it in my car during breaks or lunch and I pray to God on my way to school in my car before listening to my Chrisitan music. Then if the need strikes me to pray throughout the day, I do so at my desk quietly in my head; no one can even tell and it makes me feel closer to Him! I also try to make a habit of talking to God on my walks with my son when I get home. And lastly, I wasn’t sure if I would admit this one, but seeing the paragraph of the sister praying in the bathroom, I felt boldened. Sometimes if my day is just too busy, I’ll pray in the shower! At first I felt this was inappropriate, how dare I pray to the Lord naked?! But after some research and praying, I no longer feel ashamed of it. It’s quiet, peaceful, and it is a truly humbling experience for me; he already sees us “naked” anyway (physically and spiritally). It is a vulnerable experience that has worked for me to feel closer to God everyday! Hi everyone,lm so blessed reading all the ideas where everyone spends time worshiping God.Its very encouraging.God bless you all.As for me,l sometime do it in the park during my breaks,or just sit in the car.One day l was reading a testimony of a girl of her love for the Lord on Facebook,and she mentioned first think when she gets up she prepares herself for devotion right their and then in bed,l thought this was a great idea, that way,before you’re distracted by anything, your focus is God first thing, so lm giving it a go. I am at a place in my life where I finally have come full circle that I need to have and desire to have a close relationship with God. That all my past decisions and changes have not been what I thought I needed to make me happy and whole. I am seeking time, peace, love, understanding to help me find a place where I can visit or live to start this journey with God. My place to pray has changed many times over the years. When I first became a Christian, I was single and could pray anywhere in my apartment. But my favorite times were walking around a huge water reservoir, listening to Christian music and worshipping the Lord. Later, when I got married and started having children, the bathroom became my prayer closet. When we moved, the new house had a huge walk in closet, so I prayed there. When I went back to work, I would drop my husband and daughter off and then park and pray in my car before I had to be at work. On my lunch break, I would sometimes go to a nearby lake and park and pray. This started what has become my favorite place of prayer which is still my car. It’s the only place I feel I can be loud, sing, cry or pray however I feel without interruption or concern about being too loud, etc.